Setting aside one of the dusty albums, he pulled from the box what appeared to be a journal from his grown son's childhood. He could not recall ever having seen it before, or that his son had ever kept a journal. Why did Elizabeth always save the children's old junk? he wondered, shaking his white head. Reminded that he had kept a daily journal of his business activities over the years, he closed his son's journal and turned to leave, having forgotten the cherished photo that originally triggered his search. Hunched over to keep from bumping his head on the rafters, the old man stepped to the wooden stairway and made his descent, then headed down a carpeted stairway that led to the den. Opening a glass cabinet door, he reached in and pulled out an old business journal. Turning, he sat down at his desk and placed the two journals beside each other. His was leather-bound and engraved neatly with his name in gold, while his son's was tattered and the name Jimmy had been nearly scuffed from its surface. He ran a long skinny finger over the letters, as though he could restore what had been worn away with time and use. 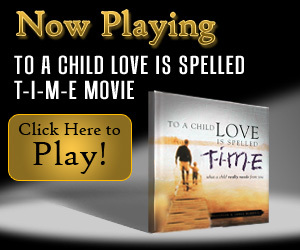 The story you just read is the introduction for To A Child Love is Spelled T-I-M-E. It was written by co-author Lance Wubbels, a best selling author for many popular inspirational books. Watch the short movie (below) featuring this story.